One hot afternoon on a day of ministry in a local park near Asunción, Mary, a volunteer with another evangelism ministry, decided to come out for an afternoon of ministry with DRIME Paraguay. She and I met a woman named Maria. Maria sells some goods at a local market and was on her way home from work when she noticed the dramas in the park. She sat down to watch the dramas when we approached her and sat down beside her to see if she knew what the dramas were about. She told us that she understood something about what was going on in the dramas. We explained more about God’s grace and Maria started sharing about her life and the difficult things that were happening to her. She told us that she was tired because her husband was sick and could not work anymore, that her brother had died a few months ago and that her children did not come home anymore. She seemed very desperate and wanted to leave quickly. This is a great reminder that no conversations that we have are by accident. Because Tanja and Mary stepped out in courage, Maria had a chance to feel more peace about her situation. Have you ever had an experience like that – where someone approached you or you stepped out in faith and approached someone and the result was life-changing? We would love to hear about it – leave a comment below! 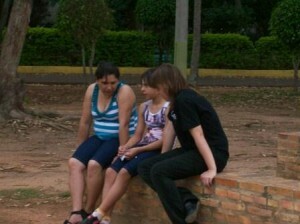 To find out more about DRIME Paraguay, click here. If you want to receive DRIME’s monthly e-newsletter, you can subscribe here.